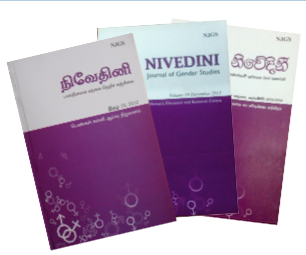 Nivedini is the only English Journal to focus on Women Studies in Sri Lanka. Its feminist perspective aims to debate and discuss new ideas both in theory and practice. In addition to serving as a resource for academics, it also establishes guidelines for policy makers. Nivedini embraces a multidisciplinary approach, while retaining an intellectual rigor and factual accuracy in a simple style. It expects the contributors to define and explain technical terms and acronyms properly. Nivedini envisages issues on gender related subjects such as media, labour, culture and sexuality from a post disciplinary perspective. The journal also contains sections that encourage debate, as well as reviews of conferences, journals, books and films. The journal welcomes submissions in all disciplines and is especially interested in paper/articles written from an interdisciplinary approach to gender issues which focuses on new directions, ideas and modes of inquiry to reinvigorate studies for a new generation of researchers and readers. Production and reception of meaning and knowledge. Cultural institutions, practices, policies and powers. Technology, change, development and globalisation in media and culture. Convergences between intellectual, popular and corporate culture. Cultural studies of neglected regions or areas of inquiry. Debate on the adequacy and future of various disciplinary traditions, methods and topics in cultural studies.